Claims Customer Service Representative act like a mediator in-between the customers and the insurance company, assess the client’s situation and determines the claim amount. Apart from this main work, these representatives should see if the claim sought is valid or not, and how much compensation needs to be given. The Claims Customer Service Representative gathers information, makes research, analyzes and checks the claimed authenticity. 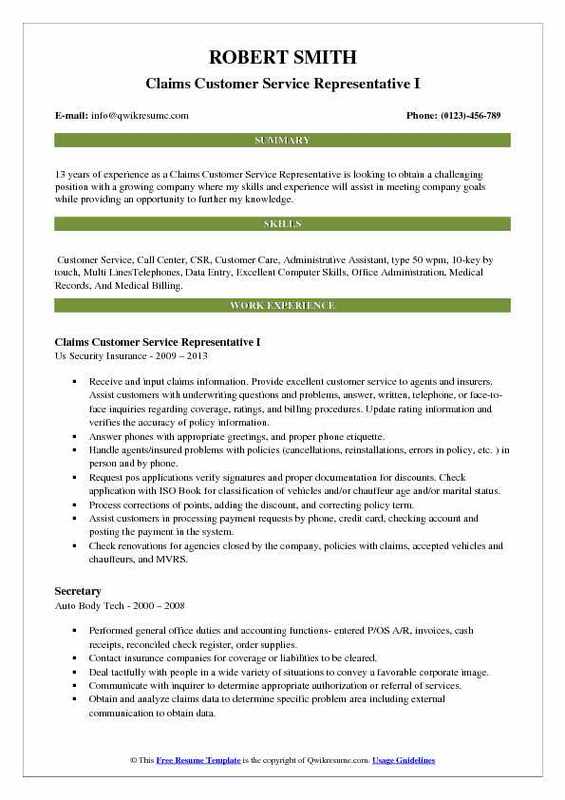 The most successful Claims Customer Service Representative Resume sample showcases complex skill sets like researching and investigating skills, attention to detail, result oriented approach, negotiation ability and good verbal communicative skills. Even though a high School diploma may be enough to seek this job, a college degree in insurance studies or business will prove to be a major advantage. Headline : 6+ years of experience as a Claims Customer Service Representative is seeking to secure a rewarding and challenging career in business administration with a progressive organization. Skills : Microsoft Outlook, Microsoft Word, Microsoft Excel, Microsoft PowerPoint, QuickBooks, LexisNexis, Typing 50 WPM, Customer Relations, Business Ethics, Accounting, Sales, Staffing, Quality Control, Time Management, Management, And Insurance. Training new claims service representatives on daily administrative duties. Editing and proofreading legal disclaimers and reservation of rights letters prior to adjusters. Making payments for total loss settlements and repairs on first party and third party auto claims. Providing project management reports to meet various business objectives. Responsible for training new claim service representatives on tasks relating to daily. Assisting with day to day operations providing fundamental support to the workers’. Assisting lost time and medical only for workers’ compensation, general liability, property. Making payments to health provider and vendors for services rendered under workers’. Responsible for the request to providers, vendors or attorneys for medical records, bills or any. 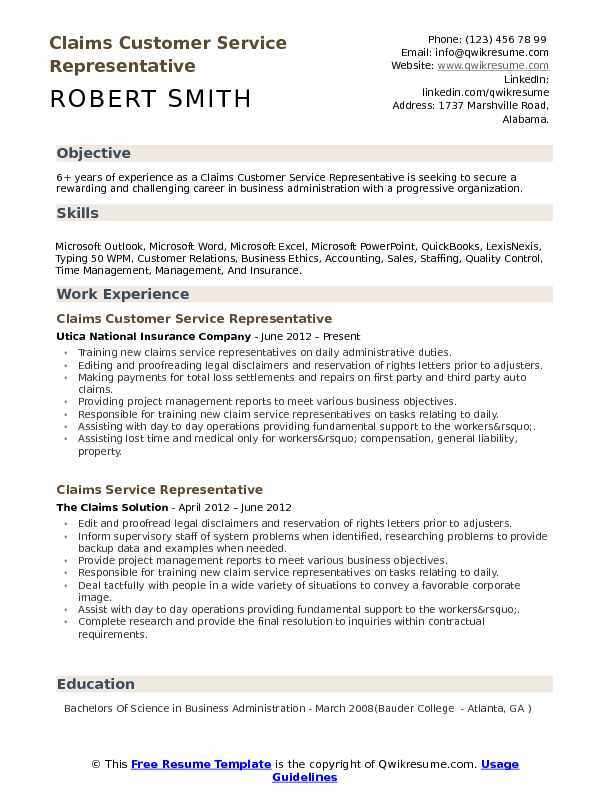 Headline : Claims Customer Service Professional with over 7 years progressive experience in Personal and Commercial Insurance claims, Underwriting, and Customer Service for one of the largest independent insurance and managing general agencies (MGA) in the country. Skills : Quality Control, Time Management, Customer Service, Customer Relations, Call Centre, Office Administration, And CSR. Gathered initial claim information and coached clients/claimants throughout the claims process. Responsible for monthly financial statements, claims reports, and company bordereaux. Issued claims checks and updated client files within the agency manager (tam) applied system. Developed claims procedure guide to allow other employees to gather initial claims information. Mediated communication between customers and adjusters to resolve the conflict. Prepared loss runs reports as requested by customer service representatives or managers. The designated processor in the St. Croix offices for IHG Sirius underwriting system. Responsible for transferring data from the marshal sterling tam system to IHG Sirius system. 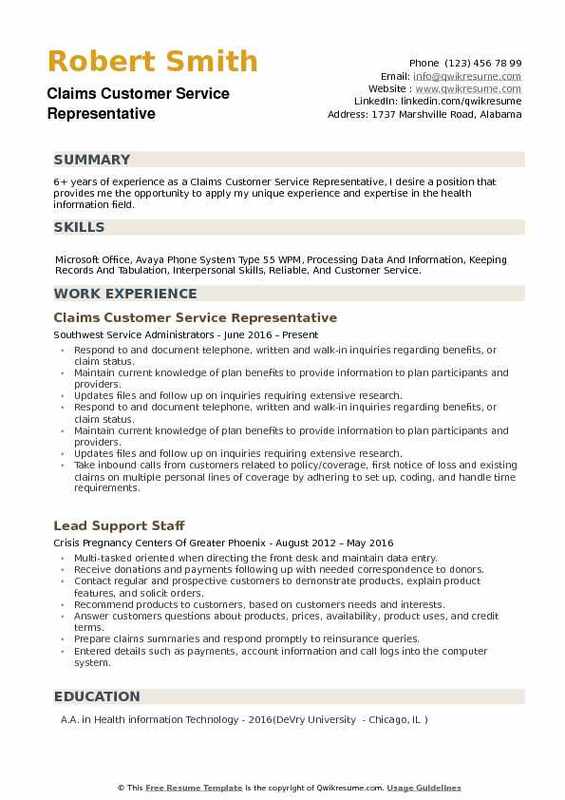 Summary : 13 years of experience as a Claims Customer Service Representative is looking to obtain a challenging position with a growing company where my skills and experience will assist in meeting company goals while providing an opportunity to further my knowledge. Skills : Customer Service, Call Center, CSR, Customer Care, Administrative Assistant, type 50 wpm, 10-key by touch, Multi LinesTelephones, Data Entry, Excellent Computer Skills, Office Administration, Medical Records, And Medical Billing. Receive and input claims information. Provide excellent customer service to agents and insurers. Assist customers with underwriting questions and problems, answer, written, telephone, or face-to-face inquiries regarding coverage, ratings, and billing procedures. Update rating information and verifies the accuracy of policy information. Answer phones with appropriate greetings, and proper phone etiquette. Handle agents/insured problems with policies (cancellations, reinstallations, errors in policy, etc. ) in person and by phone. Request pos applications verify signatures and proper documentation for discounts. Check application with ISO Book for classification of vehicles and/or chauffeur age and/or marital status. Process corrections of points, adding the discount, and correcting policy term. Assist customers in processing payment requests by phone, credit card, checking account and posting the payment in the system. Check renovations for agencies closed by the company, policies with claims, accepted vehicles and chauffeurs, and MVRS. Provide referrals to the serious injury group (SIG) and first response referral program. Greet visitors, determine the nature of their visit, provide appropriate information and refer visitors to appropriate person. Aid to underwrite and request supporting documents on pos applications as needed. 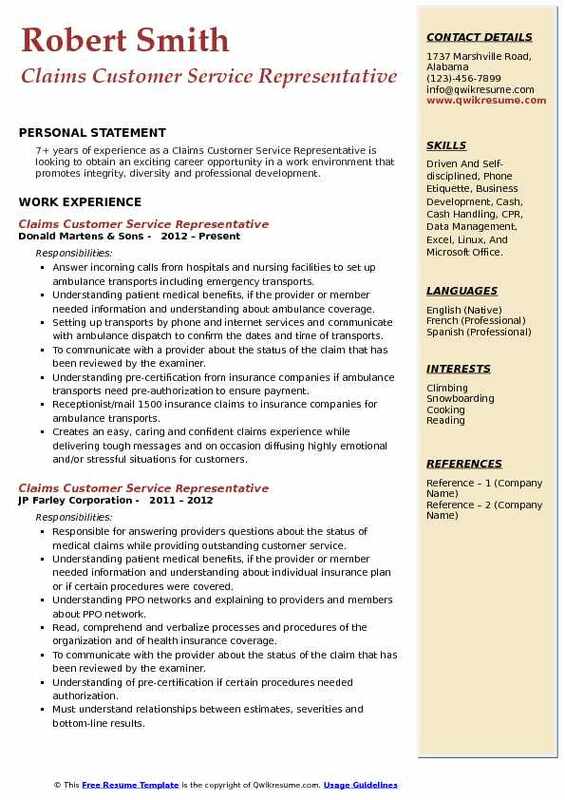 Headline : 6+ years of experience as a Claims Customer Service Representative is now seeking a position in your company as Customer Service Specialist where my knowledge of the medical field and Customer service could be fully utilized. I am a dedicated team member with a solid skill set that allows me to follow through with detail-orientated tasks. 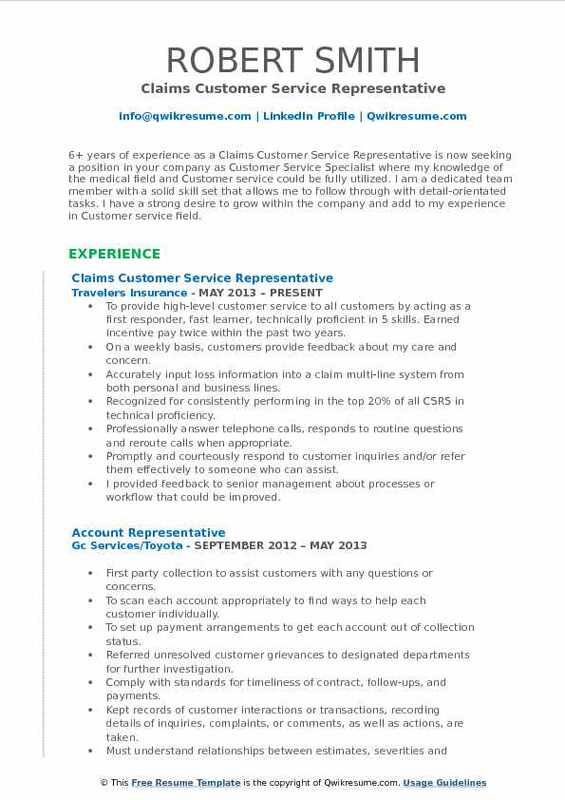 I have a strong desire to grow within the company and add to my experience in Customer service field. Skills : Word Proficient, Outlook, Publisher, AS400 Knowledge, Business Works, Rome Complete Shop, And Shop Manager. To provide high-level customer service to all customers by acting as a first responder, fast learner, technically proficient in 5 skills. Earned incentive pay twice within the past two years. On a weekly basis, customers provide feedback about my care and concern. Accurately input loss information into a claim multi-line system from both personal and business lines. Recognized for consistently performing in the top 20% of all CSRS in technical proficiency. Professionally answer telephone calls, responds to routine questions and reroute calls when appropriate. Promptly and courteously respond to customer inquiries and/or refer them effectively to someone who can assist. I provided feedback to senior management about processes or workflow that could be improved. Actively participate in all team meeting by volunteering to research questions of my peers. I assist my unit manager with preparing a meeting agenda, including facilitating a meeting in her absence. Objective : 3+ years of experience as a Claims Customer Service Representative is seeking to obtain a position where I can utilize my experience and professionalism, with a customer-value team in an atmosphere where responsibility is the top priority. Skills : 35 WPM, Customer Service, Excel, Microsoft Word, MS OFFICE, Call Center, CSR, Customer Care, Microsoft Applications, Selling and Product Knowledge, And Administrative. Receiving telephone, written, fax, and e-mail inquiries concerning eligibility benefits determinations, and claims adjudication questions or billing problems. Applying appropriate provisions of regulations, interpretations, and procedural directives in making determinations on eligibility and benefits to determine appropriate responses to inquiries. Obtain and analyze claims data to determine specific problem area including external communication to obtain data. Complete research and provide a final resolution to inquiries within contractual requirements. Informing supervisory staff of system problems when identified, researching problems to provide backup data and examples when needed. Assist account managers in providing on-going support to each client by handling all eligibility processing, enrollment packets, claims support, and general inquiries. Review customer claims for accuracy and recovers any inaccurate losses. Educates clients as needed by reiterating/clarifying items previously discussed with the account manager. Assisted clients with enrollment/benefits questions, processed terminations, benefit and cobra enrollments, verified benefits and eligibility. 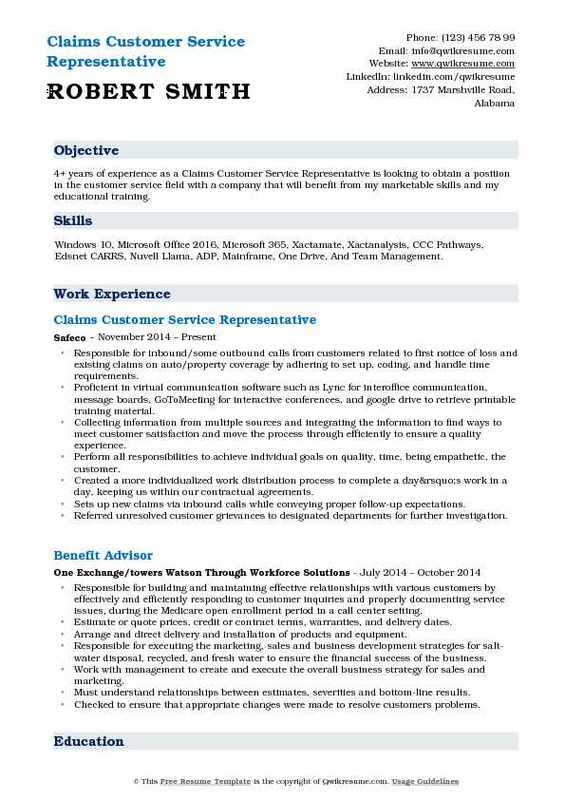 Objective : 4+ years of experience as a Claims Customer Service Representative is looking to obtain a position in the customer service field with a company that will benefit from my marketable skills and my educational training. Skills : Windows 10, Microsoft Office 2016, Microsoft 365, Xactamate, Xactanalysis, CCC Pathways, Edsnet CARRS, Nuvell Llama, ADP, Mainframe, One Drive, And Team Management. 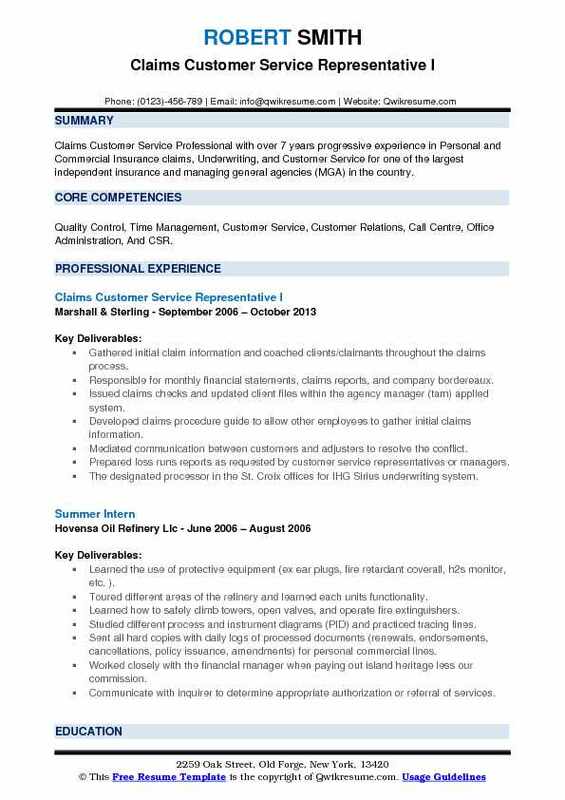 Responsible for inbound/some outbound calls from customers related to first notice of loss and existing claims on auto/property coverage by adhering to set up, coding, and handle time requirements. Proficient in virtual communication software such as Lync for interoffice communication, message boards, GoToMeeting for interactive conferences, and google drive to retrieve printable training material. Collecting information from multiple sources and integrating the information to find ways to meet customer satisfaction and move the process through efficiently to ensure a quality experience. Perform all responsibilities to achieve individual goals on quality, time, being empathetic, the customer. Created a more individualized work distribution process to complete a day’s work in a day, keeping us within our contractual agreements. Sets up new claims via inbound calls while conveying proper follow-up expectations. Summary : 13+ years of experience as a Claims Customer Service Representative is to secure a position within the insurance industry this focuses on customer and client satisfaction while promoting continuous professional growth. Skills : Microsoft Office Suite: Word, Excel, PowerPoint, Lotus Notes, MS Outlook; NFR, Claims Intake Systems, Coverage Verification Systems, Customer Service, Call Center, CSR, And Customer Care. Monitoring aging claim files pending inspection reports older than 15 and 21 days for follow up. Reviewing report data for foreclosure properties to determine if new claims for damages need to be. Processing customer requests to file new property damage claims and explaining coverage information. Answering customer inquiries regarding claim status and settlement information. Responsible for assisting with training and development of both new hire and catastrophe temp. Handling escalated customer complaints regarding claim issues to ensure one call resolution. Assisting customers with on­site claim reporting after a catastrophic event. Kept records of customer interactions or transactions, recording details of inquiries, complaints, or comments, as well as actions, are taken. Prepare claims summaries and respond promptly to reinsurance queries. 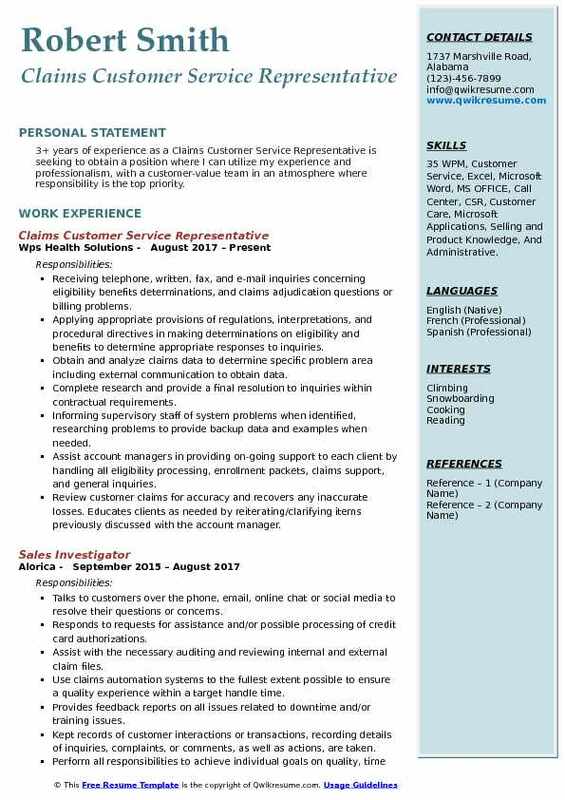 Summary : 17+ years of experience as a Claims Customer Service Representative to obtain long-term employment with a reputable company that has the potential for growth and becoming an asset in the company now & in the future. Skills : Microsoft Office, Windows Operating Systems, Ubuntu Operating Systems, Linux Operating Systems, Windows XP, Microsoft Word, Microsoft Works, Power-point, And Excel, Used In-house System, 3 Incoming Lines, And 25 Extensions For Dispatch Position. Responsible for maintaining a working knowledge of care1st division of financial responsibility matrix (DOFR). Data entry and maintenance of inquiries, researching status of provider claims and document findings in the computerized tracking system. Understanding claims processing guidelines such as claims timely submission and payments. 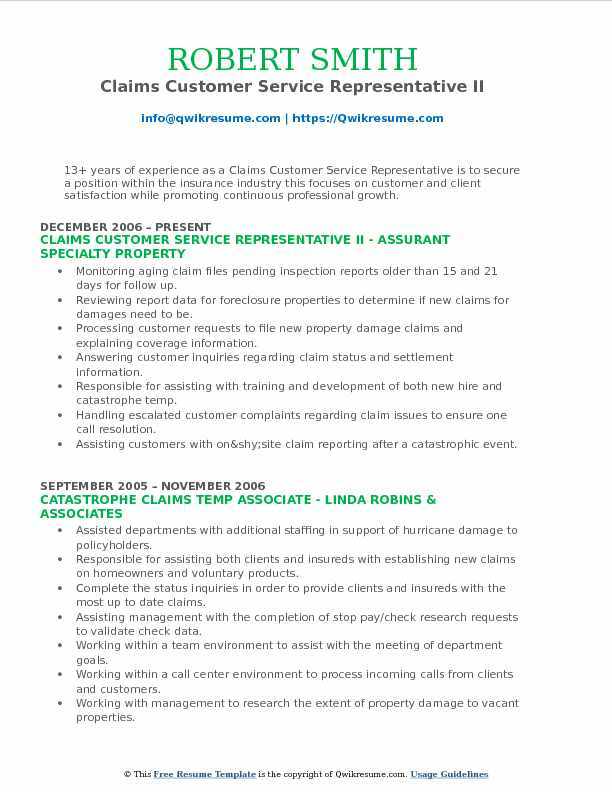 Respond to telephone and written inquiries related to the status of claims and maintain great customer service skills. Proficient knowledge in icd9 and icd10, MHC, CPT, and HCPCS. Facilitating both inbound/outbound calls to ensure health plan memberships were up to date. Providing information to clients and providers regarding their "claims" records. Understanding of eligibility protocol for medical and programs enrollment processes required. Take first notice of losses on new claims, and move those claims through as much of the claims process as possible. Assist claims managers, by preparing documentation to help evaluate and report specific claims. Summary : 7+ years of experience as a Claims Customer Service Representative is looking to obtain an exciting career opportunity in a work environment that promotes integrity, diversity and professional development. Skills : Driven And Self-disciplined, Phone Etiquette, Business Development, Cash, Cash Handling, CPR, Data Management, Excel, Linux, And Microsoft Office. Answer incoming calls from hospitals and nursing facilities to set up ambulance transports including emergency transports. Understanding patient medical benefits, if the provider or member needed information and understanding about ambulance coverage. Setting up transports by phone and internet services and communicate with ambulance dispatch to confirm the dates and time of transports. To communicate with a provider about the status of the claim that has been reviewed by the examiner. Understanding pre-certification from insurance companies if ambulance transports need pre-authorization to ensure payment. Receptionist/mail 1500 insurance claims to insurance companies for ambulance transports. Creates an easy, caring and confident claims experience while delivering tough messages and on occasion diffusing highly emotional and/or stressful situations for customers. Use claims automation systems to the fullest extent possible to ensure a quality experience within a target handle time. 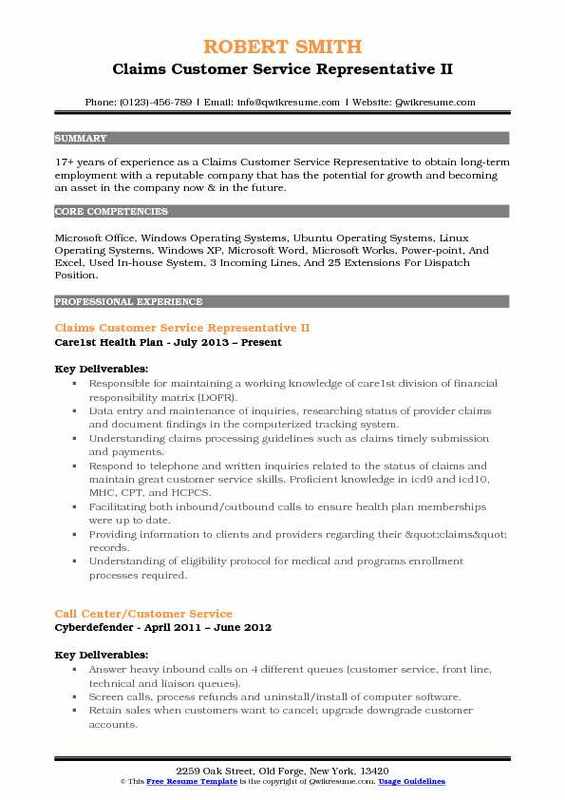 Headline : 6+ years of experience as a Claims Customer Service Representative, I desire a position that provides me the opportunity to apply my unique experience and expertise in the health information field. Skills : Microsoft Office, Avaya Phone System Type 55 WPM, Processing Data And Information, Keeping Records And Tabulation, Interpersonal Skills, Reliable, And Customer Service. Respond to and document telephone, written and walk-in inquiries regarding benefits, or claim status. Maintain current knowledge of plan benefits to provide information to plan participants and providers. Updates files and follow up on inquiries requiring extensive research. Take inbound calls from customers related to policy/coverage, first notice of loss and existing claims on multiple personal lines of coverage by adhering to set up, coding, and handle time requirements. Respond to member and provider inquiries via telephone regarding health insurance benefits, eligibility, and claims. Assist with the necessary auditing and reviewing internal and external claim files.